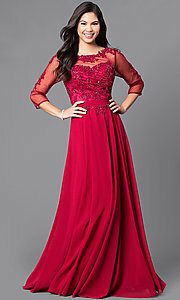 Unfortunately, the dress you are looking for (Style: DQ-9473, Name: DQ-9473) is no longer available. You'll stand out from the crowd in this long prom dress that is lavishly designed for your grand entrance. 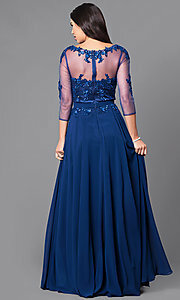 Eye-catching sparkling beaded-lace appliques adorn the illusion bodice on this beautiful evening dress. Shimmering lace trims the sheer bateau neckline and three-quarter-length sleeves before cascading past the natural waistline. The full and fabulous long chiffon skirt on the lovely prom dress flatters your figure as it flows to the floor. 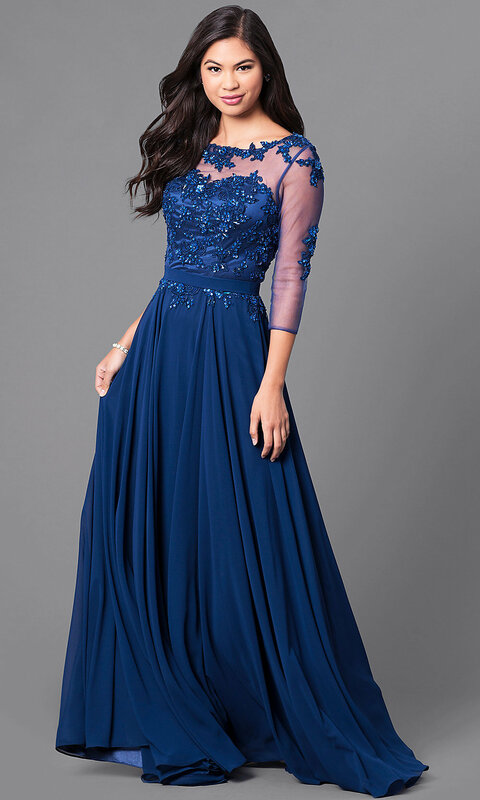 Under $200 and available in misses and plus sizes, this long prom dress is a glamorous find for a military ball or formal dance. The model is 5' 9" and wearing 4.5" heels. 61", Hollow to Hem 59"